While down in LA for Dwell on Design this year I had a chance to stop into the Heath Ceramics LA shop to look around, check out the Playmountain show which is up now, and have lunch with Heath's LA honcho, Adam Silverman. I also took a few photos of the space, which was designed by the very talented Angelenos at Commune Design. All told it made for a very nice afternoon and I can't encourage you enough to stop into the shop at 7525 Beverly Boulevard, just past Fairfax. Have a look at the slideshow to see what I saw. Here's a nice photo taken from the door that gives you an overall sense of the space. Quite airy and bright with lots of sun coming in the massive windows that face Beverly Boulevard. In the foreground on the right is Silverman's Hybrid series of pots and vases. They take classic Heath forms and marry them with new glazing techniques that give them something of a sunken treasure feel. Unlike the Sausalito store, which is much smaller, the LA shop has ample space to display the full range of Heath's wares. Here's a nice look at the Chez Panisse line. LA–based Commune Design did the interior of the Heath LA shop. 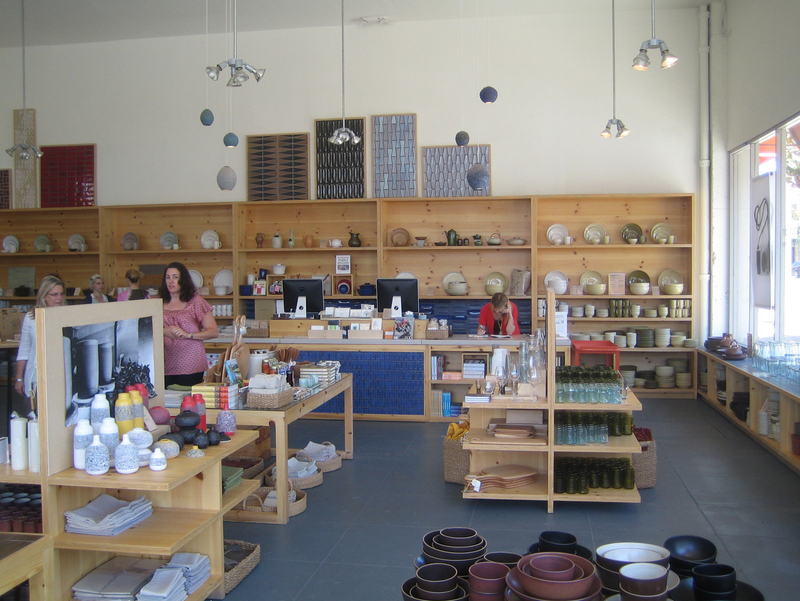 Silverman described it as a hands-on collaboration between client and designer, and if you like the space you'll surely like Commune's wares, which are sold in the store. Their tablecloths and napkins are hanging on the A-frame display in the middle of this shot. A pretty humble canopy hangs over the entry to the office and workshop in the back. It also helps demarcate a small exhibition space and sets it apart from the rest of the shop. At the moment Heath is showing a curated bunch of goods from the Japanese store Playmountain. Be sure to stop into the 90-day pop-up shop this summer. Here's a proper look at some of the objects for sale at the Playmountain pop-up shop. Lots of pretty simple, functional stuff, but really really pretty. The whole show is a smattering of objects from Playmountain, a Tokyo design shop run by designer Shinichiro Takahara. The show is up through September 5th. I couldn't resist these handmade leather camera cases. I bought the one in brown leather, and for a mere 70 bones they struck me as pretty reasonable for a fine Japanese good. They're made by Playmountain founder Shinichiro Nakahara's brand Landscape Products. One of my favorite bits from the Playmountain show were these tops. Hand-carved and wonderful spinners, there are amongst the very cool little collection of toys at the show. Back behind the shop is a nice courtyard that Silverman has kitted out with some Marmol Radziner outdoor furniture. It makes for a nice spot for parties and hanging out. Unlike the Sausalito store, which has the proper Heath factory behind it, the LA iteration has a much smaller and more artisanal studio in the back. It's where Silverman experiments with glazes and colors. I liked the chalkboard walls and busy workstation. There are a couple kilns and storage space in the back as well. I couldn't resist adding this picture from the Dwell on Design show floor. It's the Heath Van festooned with images of their pottery!